This one is for sure an instant favorite – you certainly can’t go wrong with Heather Ross fabrics. Anyone who’s sewn with these fabrics know how supremely soft and lovely they are. 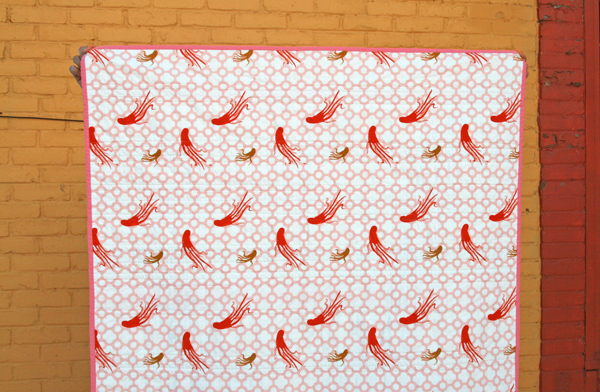 And because the Heather Ross fabrics are so fabulous, I opted to not piece the backing and instead use one full piece of this octopus print. 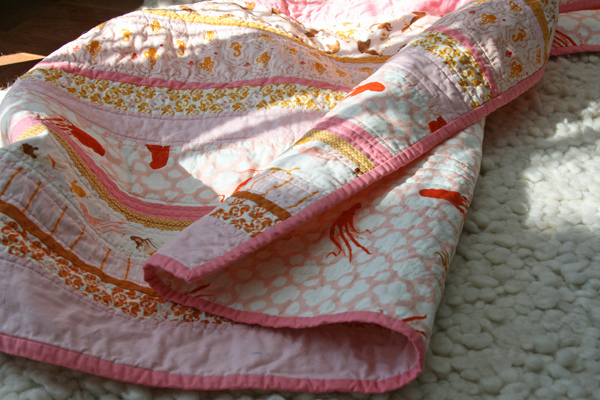 As you can imagine, the result is a super soft quilt – one I wish was more my size and less baby sized! This entry was posted in [search] Strip Quilts, baby, Finished Quilts, Posts about Quilts, Quilts and tagged baby girl quilt, baby quilt, handmade, Heather Ross, mendocino, quilt, quilting, strip quilt. Bookmark the permalink. I’m in love! I’ve been hoarding my HR fabrics but now I think it’s time for them to come out and play! This is so weird! I JUST finished quilting a Mendocino strip quilt last night! I only have the binding left to sew on now. Your quilt is prettier since it has more color and strips! Such a sweet combination, as usual! Very cute! The orange really does help balance out all the pink. How do you finish so many quilts a week? Okay, I know it’s long strips, but still. Love it, too! love this ashley and yes, those fabrics are so so soft!!! Love this one! There’s something about the combinations of pink and orange here that strike a cord with me. I would be wishing it was my size too! I have not yet bought any of Heather Ross’s fabrics (gasp!) although I have been admiring them from afar and wanting to buy some! I am wondering…. 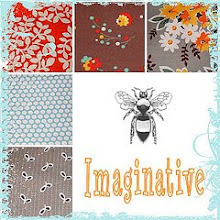 I know she designs for kokka and she also puts some of her fabrics available on spoonflower. Which are these that are so soft?!! Actually (and unfortunately!) the super soft fabrics are those that were produced by Free Spirit. Unfortunately, those lines are now out of print. Let’s hope she’ll be able to work with them again in the future for another line!! Wow, thanks for such a quick response. I guess I am a little slow on to the Heather Ross scene. I knew about Mendocino (kind of), but did not know she at one time designed for Free Spirit. Their fabrics are very nice. Thanks for the info! I have quickly become a fan, so hopefully in the future I will not miss out on such awesome lines! Oh, and I absolutely LOVE the quilt! I quilted this one with horizontal lines, about a 1/4″ away from the seam lines. My daughters nursery is based around the fabric. I made a twin sized quilt out of this fabric and it is amazing. Wishing I still had more fabric. Will you be selling this one? I’m not sure yet if I’ll be selling this one. It may show up a little later on in the shop! Love the giant piece of heather ross on the back – I love seeing great prints on the back. So many people try to economise, and it makes a quilt so much more useful if the back is as indulgent as the front! I REALLY love this one, love the orange and pink, love the theme, love the sugary, love the stripes, love, love, love. Okay, I’m inspired to cut up my Mendicino. 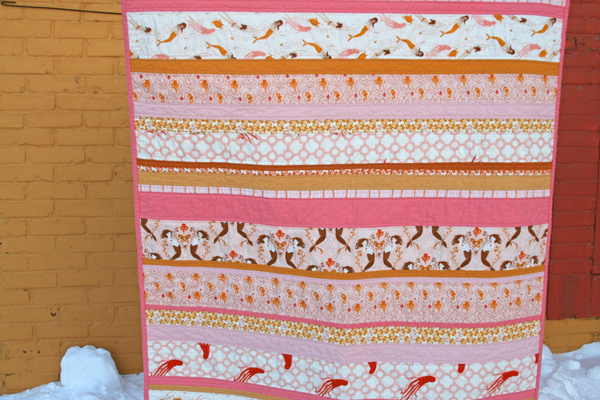 Your quilt is beautiful and I love how you added just enough orange to keep it from being too pink. Another darling strip quilt! 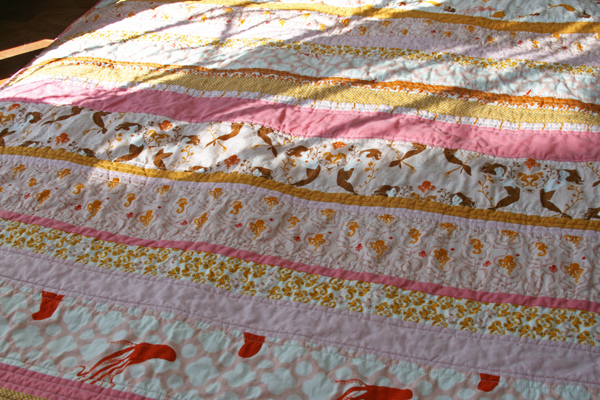 That orange is the perfect contrast and I love how your strip quilts have a nice variety of widths. Maybe if you scrunch up real tight you could fit! I am loving strip quilts right now! I just got some Dr. Seuss fabric to make a strip quilt- can’t wait to get started! I am curious how you decide the widths of your strips-to make it look appropriately proportioned. And what is the overall finished size (for a baby quilt). I’m thinking WOF x about 60ish inches. Love it! There has not been a quilt of yours that I have not been very impressed with, but I think this one is a favorite of mine. So, so pretty. Fresh and springy and lovely, but not too sweet–I think the extra bits of orange were a great touch! Seems like every quilt you make is my “favorite”!! I really, truly love this one. how many quilts for the baby so far? do we have a running total??? These stripes did not disappoint Ashley. Gorgeous! I have the blush mermaids and coordinating fabric I have been trying to find the perfect fabrics to coordinate so I may have a little of the mermaids for myself (quilt is for my neighbour), these colors are great! I love strip quilts too, I am trying to get enough of the aqua mermaids to make one for my daughter. I have the swim sisters, the seahorses just need the presentation sisters to really make it perfect…I check ebay and etsy every day hoping one day there will be some. I read your blog everyday on my coffee break at work, actually your inspiration really got me into quilting, I love your work. Congratulations on the approaching bundle of joy! I cannot wait to try one of these quilts! 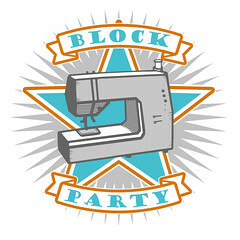 The concept of these seem simple but I am a very new quilter and don’t want to make a mistake and mess up a lot of fabric so I would love a tutorial! You have my wheels turning. I love that about you. I have a pile of Mendocino in my stash that I have been waiting to cut into. This is a great project idea! It would be perfect for a beginnner quilter like me. This is THE quilt I’ve been dreaming of! I’m new to sewing and have become obsessed with Heather Ross fabrics, especially these! In my mind I’ve been created a quilt with them (without even knowing how to do it!) and this is it. Thanks for the inspiration…just beautiful! I love this quilt – a wonderful use of some wonderful fabrics. Pink and fresh but not too sickly sweet. Absolutely lovely! hi ashley! just want you to know i love everything you do, you have inspired me so much! i just started a little blog of my own in fact, mostly so i can tell my husband i “need” to finish whatever little craft i’m working on and he “needs” to watch our two crazy little boys 😉 surely this will work for you too in the oh so near future! i love strip quilts, they are simple but have SO much potential! i was wondering if you plot and plan every strip width and placement or do you just go with the flow? I love this line from Heather Ross…it has such a nice hand to it! I adore this quilt. I love sewing with Heather Ross fabric because it is so soft and wonderful. I have a box that I open up just to look at and see what I’ve collected over the years. Looking back I wish I’d bought more. 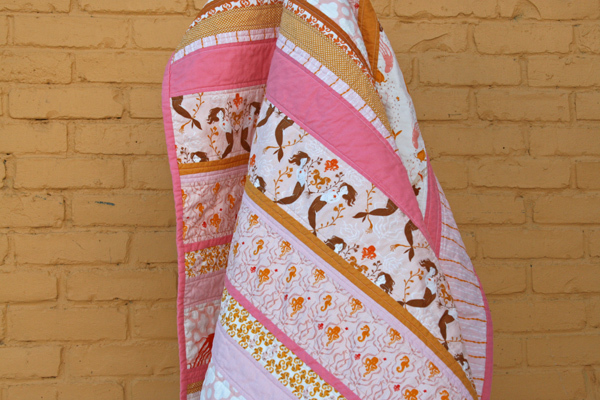 I just love the colors and cute pinkness of this quilt. Who ever the little girl is that gets this quilt will be happier then happy. I’m new to quilting and love seeing strip quilts. For me, I find seeing the way expert quilters use color is extremely fascinating and instructive, so keep ’em coming! And thanks for the tutorial. I love how the strips showcase the prints! I’m working on a quilt using a charm pack of Mendocino and after seeing yours, I can’t wait to finish it! I LOVE this so much I’ve spent hours all over cyberspace trying to find some Mendecino fabric to make this! I’m not having much luck… any ideas? Do you recall what color Kona solids you paired with this fabric? Thanks!